After waiting a few months in anticipation, my Ticwatch E arrived yesterday, a day after Thanksgiving. After being an owner of the Ticwatch 2, a watch I really liked but had a few shortcomings that needed addressed, I’m eager to discover whether the Ticwatch E has truly improved on two of those shortcomings including a better heart rate monitor and a more accurate and reliable GPS. I’m going to have to put it through several tests to reach any conclusion just yet on either of those. I also happened to come down with the flu at the same time my Ticwatch E arrived so I’m not in any condition to hop on the treadmill or go for a hike just yet. Expect a complete and thorough review to come in a couple weeks but for now my initial impressions will be more on the build of the watch and of course Android Wear 2.0, or more precisely Android Wear 2.6 since an update was already available after setting up the watch. This is my first Android Wear watch. I’m more accustomed to the Tizen operating system on Samsung’s fitness trackers and Fitbit’s OS. 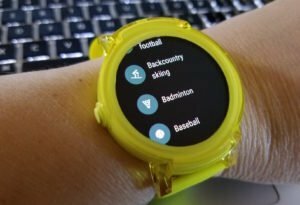 The Android Wear OS certainly opens up the possibility of much more functionality and the ability for your smartwatch to be more personalized to your lifestyle and needs. I’m a hiker so I’ve been enjoying downloading and testing out a few hiking apps from my sickbed. It’s great to be able to have access to many of the most popular hiking apps available on my watch including MapMyHike, BackCountry Navigator, and View Ranger. I’ll be putting them all to the test. 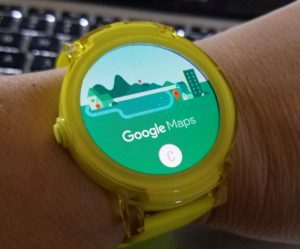 They all work with their companion phone apps but still it’s a great convenience to see where you are with a quick glance at your wrist, rather than dragging out a cell phone from your backpack. 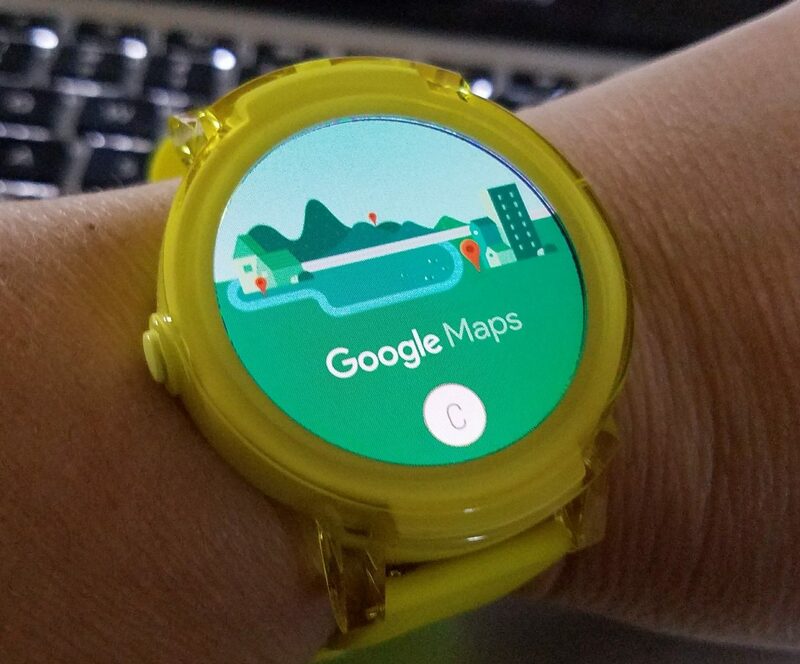 Other apps I’m looking forward to using that I didn’t have access to previously on my other watches are Google Maps, Google Assistant, Google Fit, Facebook Messenger, and several good weather apps with MyRadar being my favorite. Google Assistant is probably the greatest benefit to having an Android Wear watch. 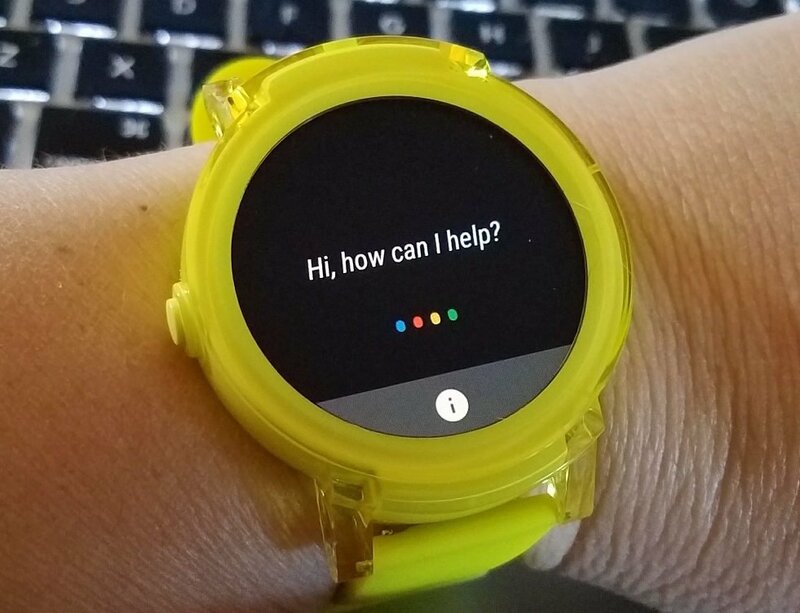 Not only can you speak into the watch with basic commands like “Okay Google, what is the weather” or “Okay Google, where is the nearest restaurant” or “Okay Google, send a text message” it opens up the door to so many other practical uses. I’m one of those people who watch TV and wonder about subjects that are being discussed or brought up. Sometimes I just want to know more about the actor or actress. I’m often Googling some of the craziest questions on my phone, like “How do you build a bomb out of mouthwash and toothpicks” or “does my cat really love me or is he faking it”. The cat likes to sit with me as I watch TV. I know I have to be on both the NSA’s and FBI’s watchlist for the things I’ve Googled and now I can ask these things into my Ticwatch E without having to type anything. So nice and the NSA will have so much more on me than ever before! I have to be honest that I wasn’t overly impressed with the build quality of the watch right out of the box. I had come accustomed to the much weightier and tougher build of the Gear Sport, a watch I recently reviewed and think is awesome. 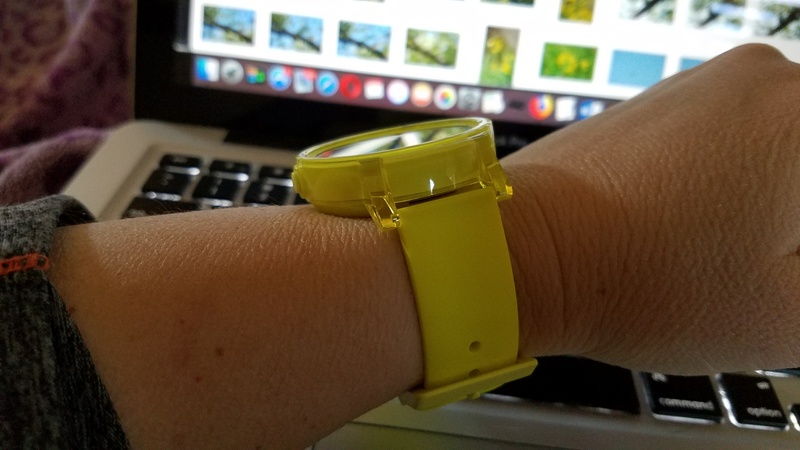 The Ticwatch E definitely has a “plasticy” feel to it, probably because it is made out of plastic. That accomplishes two things. It makes it very lightweight and keeps manufacturing costs down. 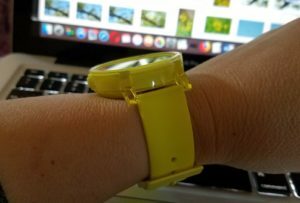 The strap is the same familiar soft silicon that I like about the Ticwatch 2. It’s a very comfortable watch to wear, though the Ticwatch 2 is more comfortable because of the more refined curved design of the back of the watch. Something I was most curious about was the color. The E comes in three different colors – black, white, and lemon yellow. I decided to go bold and different and get the yellow version, even though it was difficult to tell from the pictures I saw online of what shade of yellow it truly was. Was it a more greenish yellow or a more canary yellow? It turns out it is as bright and yellow as I thought it would be. 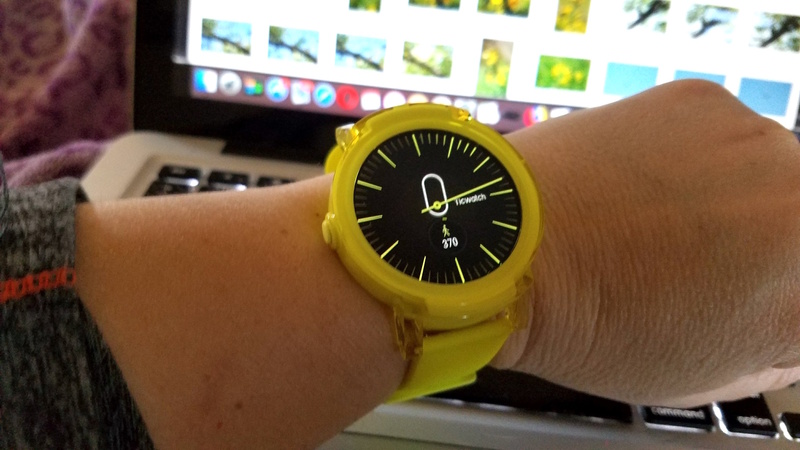 It’s more of a highlighter yellow and I have a feeling everyone is going to notice it on my wrist, which is a good thing because I can introduce them to one of the most affordable smartwatches running Android Wear on the market. Height of the Ticwatch E shown on wrist. In fact, I think it is the most affordable and I had to keep that in mind when reviewing the watch because I shouldn’t expect the same build quality as a Garmin Fenix or even the Gear Sport, not when the Ticwatch E costs so much less. I’m hoping durability will be good but only time will tell; however, it feels solid. There’s no give to the watch case. Everything seems to fit together nicely with good attention to detail, though I wish the plastic brackets that the strap attaches to had more rounded edges for a smoother feel. The screen is a 1.4 inch color OLED display, the same size as the Ticwatch 2, yet it doesn’t appear to be the same quality as the Ticwatch 2 in both resolution and just the feel of the glass. The Ticwatch 2 is more responsive but that’s not to say the E is bad; it just isn’t as good but then it costs less. That’s the trade-off. The watch is rated IP67 meaning it is resistant to dust and splashes of water. I would have preferred it to be completely waterproof to 50 meters but I don’t think you have to worry about destroying the watch if you get caught in the rain or accidentally submerge it in shallow water for a couple minutes. I just wouldn’t do it too often. A frequent complaint I kept encountering in comments on Ticwatch’s Facebook page was the terrible battery life right out of the box. Mobvoi, the maker of the Ticwatch, recommends that users completely drain and recharge the watch at least three times to get the battery “conditioned” properly. So far my experience has been what I would expect. It came with a little less than 50% battery and after setting everything up, pairing it with my phone, downloading software updates, and looking through the menus to get acquainted with the watch it drained down quickly as expected. The Ticwatch 2 was the same when I got it and battery life greatly improved after the first few days. I’m seeing the same thing happen with the E, at least after the first two rounds of recharging. It’s already improving. However, I am missing the greater amount of options the Ticwatch 2 offered to help optimize battery life. The E doesn’t have nearly as many options. That’s kind of a bummer. I’m also missing all of the quick cards that I could easily access and swipe through on the Ticwatch 2. Honestly, I prefer the intuitive layout of the Ticwear OS over Android Wear. I wish they could have kept more of the Ticwear layout for the E and S versions. 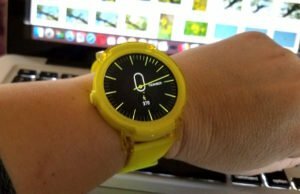 Yeah, I know it’s Android Wear and it offer more functionality but I’m not the only reviewer who prefers the experience of the Ticwear OS over the somewhat bland and less intuitive Android Wear experience. Well, I guess you can’t have everything. So overall, the more acquainted I get with the Ticwatch E, the more I’m appreciating its features. I’m eager to get on the trails and try out those hiking apps and the GPS. I’m also eager to put the heart rate sensor through several tests. If the watch can live up to its promised battery life of 1.5 – 2 days and be relatively bug-free of software weirdness and truly have more reliable HR and GPS sensors it will be well worth its affordable price tag. So far so good on my initial tests… as I gargle saltwater for my inflamed tonsils. Google Fit Workouts, lots of them! 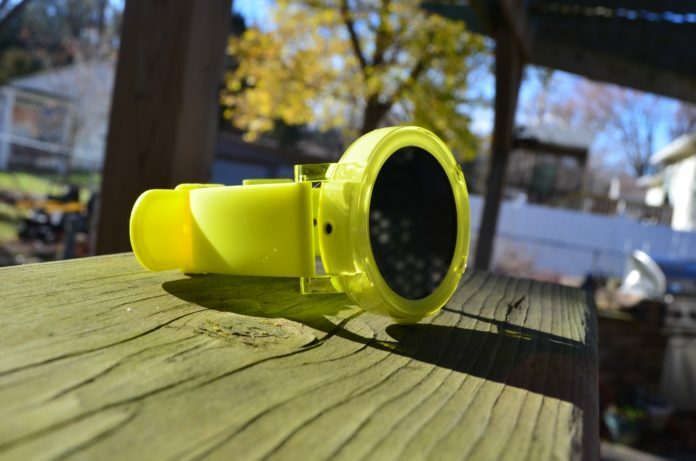 Look for the complete video and review article in a few weeks as I put it through its paces. I don’t think it’s possible to give an honest and trustworthy review until the person reviewing the product has used it in their daily lives for a few weeks or longer. There’s only so much you can tell so soon but I’m happy thus far.